To improve VoIP call quality, businesses often overlook the simplest solutions. Assuming you make most of your calls over the computer, your headset may be responsible for many of your call quality issues. 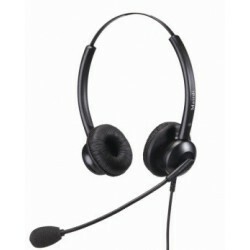 Cheap or obsolete headsets come with thin, poorly-insulated cables, reducing audio clarity. To avoid these problems, invest in headsets with short, insulated cords, and replace them whenever the cords show signs of decay. This is particularly important if some of your employees will be making VoIP calls from home, as their personal headset choices may not be adequate for your business needs. MRD-308SSingle earpiece with superb clear sound Noise cancellation microphone protects callers ..
MRD-308DSNoise cancelling microphone screens out background noisesDouble earpiece ideal for dedicate..